CANTON -- Bigfoot, Darth Vader, superheroes, pro wrestlers, and ghost hunters will all gather when the Northern New York Nerd Con makes its debut Sept. 15 at Canton Recreational Pavilion, 90 Lincoln St.
Dean Gleason of Lisbon is a Bigfoot investigator and enthusiast. He runs the Seaway Valley Bigfoot Research group where other North Country residents gather information about sightings. Dean has been working on a Bigfoot documentary here in Northern New York and is working to have it aired on television. He will be part of a Bigfoot panel and show some footage from his documentary. Brian Harnois of Ghost Hunters will attend. The paranormal reality show debuted in 2004 on Syfy and ran until the fall of 2016. He will sell his vintage collectibles, sign autographs, take photos with attendees and answer questions people may have. A Darth Vader cosplayer will don a $7,000 suit to the delight of fans. He will be joined by storm troopers from Star Wars. Photo ops will be available. 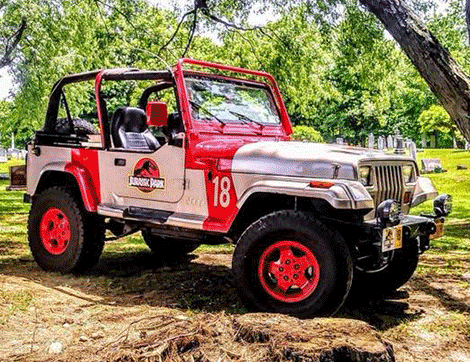 There will be two Jurassic Park jeeps for people to take photos with as well. Cosplayers are raising money for Make-A-Wish Foundation and will accept donations toward the cause. A raffle basket will benefit the Special Olympics. A portion of all tickets sold will benefit Special Olympics as well. About 40 vendors will offer their wares of collectibles, comic books, toys and more in a variety of nerd genres. The event runs from noon to 7 p.m. with VIP ticket buyers getting in an hour earlier. VIP tickets are $20. General admission tickets are $10. A ticket will allow people to have photos with any cosplayer or other event guest. Jack Vaisey, organizer of the event, says he is already planning for next year’s event. He is working with SUNY Canton to host the next nerd con at the Roos House.